Microsoft XBox Live Arcade service plans to release 5 classic games title every week on Wednesday until 9th August 2006. Xbox Live Arcade is an online service operated by Microsoft to distribute video games to Xbox and Xbox 360 owners with each games cost about USD $5 to $15. The 5 classic games from 1980s that will be released are Frogger (Konami), Cloning Clyde (NinjaBee), Galaga (Namco), Street Fighter II: Hyper Fighting (Capcom) and Pac-Man (Namco). As they are 1980s classic arcade games, so some of these arcade games are available to be played online too, for free. To play online, Shockwave or Flash player plug-ins may be required. 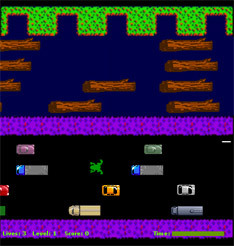 Frogger game’s objective is to guide a frog to its home by successfully dodge cars and navigate a river full of hazards, with bonuses along the way for skillful and lucky player. Frogger can be played here or here (no longer available). Pac-Man is a maze game where the player controls Pac-Man, a yellow circle with a mouth, to navigate a maze while eating small dots and other item prizes while escaping from four ghosts (Blinky, Pinky, Inky and Clyde) which also wander the maze in an attempt to catch Pac-Man. A level, or board, is finished when all the “dots” are eaten. Play Pac-Man here (no longer available) or here (a clone). 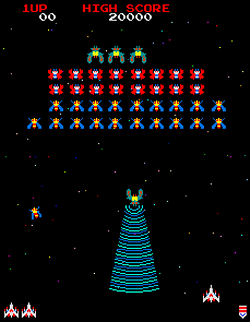 Galaga is a sequel to Galaxian where player controls a spaceship (which can move only right or left) and shoots at swarms of incoming insect-like aliens which fly in formation above him and occasionally swoop down to bomb him in a kamikaze-like dive. Play Galaga here.